"Since at least 1999, the primary thrust of our preservation mission has been to preserve the single family homes in J.L. Cochran’s first three subdivisions along Kenmore, Winthrop and Sheridan Road that survived the various waves of teardown and new construction. Many are excellent examples of architectural design and represent public works of art in addition to reflecting the original development of Edgewater. "Earlier this year (2008), we learned that most of the important single family homes could be saved from demolition through the creation of a City of Chicago Landmark District. 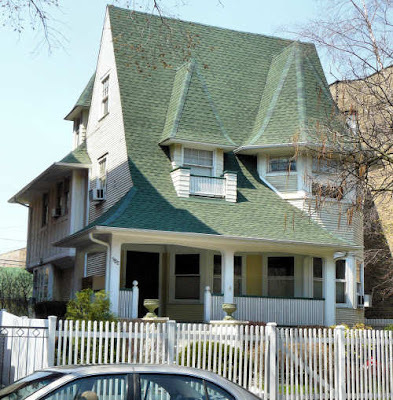 In response to Alderman Mary Ann Smith’s urging, the Landmark Commission staff reviewed the remaining single family homes north of Hollywood and submitted a list of 15 that could be included in a district. For more information, see LATEST NEWS..."
Edgewater Historical Society to learn more and to sign the petition. The 48th Ward Zoning and Planning Committee already defeated this proposal in May of last year. Okay, thanks. I'm obviously behind on this. It's still on the home page of the Edgewater Historical Society. Pictured here is the Leiser residence. Mrs. Leiser lived in that nine-bedroom house until sometime in the mid to late eighties. She lived in that enormous house all alone for many years, remaining fearlessly, while the neighborhood declined. When six-flat to the north of her home was occupied by squatters, she used to regularly garden in her large back lot and chat with the residents. Her husband Fred was in the entertainment business. He used to operate a roller-rink inside the Broadway Armory. She used to make the most delicious bourbon and waters, threw lovely parties inviting the neighbors, and had the most lovely collection of irises. I miss those irises. Her hard wood floors on the first floor were all inlaid. And the wall paper in the second floor bedrooms was magnificent, large blue birds on apple blossoms, chrysanthemums. She also owned one of the last gas-powered refrigerators on the block. I miss her. She was a darling lady. CrassulaOvata--Thanks so much for sharing your memories!